"I got a super dress, pink and white check cotton with smocking all down the front." Ma, Chump and me went into Reigate. It rained and my hair got spoilt. Went to Ma's favourite shop: the delicatessen's. Rather fab I must say - millions of pâtés, dozens of Italian ice-creams (which included lemon water-ices frozen inside real lemons), golden orange blossom honey with the cones inside, just to mention a few. Then went to Miss Mandry's where I got a super dress, pink and white check cotton with smocking all down the front. I'll wear it to Grandma and Grandpa's Anniversary - but no doubt Karolina will turn up in something extra special and make me feel inferior as usual! We left at five for Granny and Grandpa's. They were extremely cheerful which was lovely. I did a bit of La Fontaine and Chump showed them my scrap-book. Had lamb for dinner and about 10 we left. Absolutely nothing to listen to on the wireless going home. It is absolutely PATHETIC that Caroline has gone. It is INEXCUSABLE. To talk of Radio One replacing Caroline is like talking about nylon replacing silk (or to be less corny, like TV replacing the theatre). They don't even compare. I seriously feel like writing to Harold Wilson about it, but what's the good. I used to so enjoy listening to Johnnie Walker, he honestly was like a friend, not just to me but to millions. That's what they don't realise. Getting rid of Caroline is like murdering one big happy family. Daddy left early his morning to go to Birmingham to get a prize from the Duke of Edinburgh for his lighting-fitting. Ma, Chump and me went into Sutton. It rained. Dead-beat shops, except for one, Renee Shaws, where Chump and me actually got dresses. Mine is fabulous, it's in lovely thin cotton; it's like a separate skirt and blouse but is really joined up. The skirt is navy with large white daisies and the blouse is white with four navy pleats down the front. I tidied out my cupboard and got all my dresses and things in beautiful order, and I am absolutely staggered. I have got 11 dresses, and seven are for the summer! Bit miserish in evening - I hate Daddy being away. Fed up about school tomorrow. Lovely seeing Anya again, we had so much to say. Lucy thrilled with her presents and card. She too thought Whicker's 'Bird's Eye View' girls were foul, but I don't think she felt as strongly as me. Tig said she had a lovely time and learnt piles of French but had to go around by herself. Tig is Form Prefect, Liz Kennedy is Games. Where should Claire be going this summer but to Austria and the Rote Wand - such an utter coincidence!! Daddy came back early, with his award certificate. He spoke quite a bit with the Duke who he said is awfully nice. Ma played nine games of tennis with me, so sweet of her. At first it was 2-all, but then I started getting tired and lost all incentive and everything so I didn't win a single other game. Depressing, I almost felt like crying. Still, I didn't do too badly. Finally pulled up enough courage to tell Mummy I should have had a period two weeks ago, but she said she doesn't think it matters that much. Such a relief. I think it might be something to do with being on a cruise. The matron did say something about how it can upset you. My spots depress me. I thought in Austria that they'd gone at last, but my chin is spottier than ever. How I envy people with beautiful skin. I used to think I was pretty; my features still are good, but there are so many little things wrong. I can't stand the droopy bits at the corners of my mouth, and my forehead isn't nearly high enough. Wore black skirt and new blouse. It's amazing how many people said they loved it! We've now got Mr Stokes for Gen. Maths, which means you can either go to sleep or read under the desk. I did the latter, but I didn't bother to put it ('Der Roller') under the desk. For once they had an interesting article, an interview with two boys. One was a schoolboy stink and the other was a rather nice beatnik. The only trouble was, he was very scathing about grown-ups, taking it for granted that they don't understand the young. Such a feeble outlook, I think. But I suppose, because of Ma and Pa, I have an over-optimistic impression. Top of the Pops was unbelievable: The Seekers, Engelbert Humperdink, Gene Pitney, Union Gap, The Tremeloes, and, to top it all, the disgusting man who sings 'Honey'. T.O.T.P. isn't really worth looking at anymore. It's such bad, commercial pop. Why can't they have a programme dedicated to Tamla Mowtown? Period came at last, which cheered me up. Took my skiing photos to school which Anya was ecstatic about - Josef made her swoon! Pam is so lucky, she's got ten pairs of shoes. She says she spends so much on clothes she hardly has any left to spend on clubs. Play rehearsal after school. I spent ages learning my part (I'm the only one who has) but when it came to acting it, I couldn't remember a word. Well, how can you when you're trying to concentrate on your posture, your actions, your voice and your American accent, all at the same time? Looked at Tig's 'Mademoiselle Age Tendre'. They've photographed all these singers and what they looked like when they were little. So many people have dyed their hair, it's disgusting! 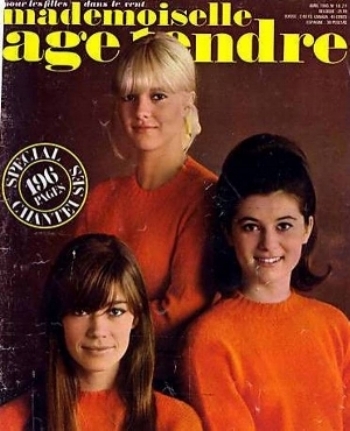 Sylvie, France Gall, Brigitte B, Catherine Deneuve, Mireille Darc. I do think Twiggy's pretty - she wears masses of make-up but it's very natural. Felt inspired to experiment with my face and draw a few little lashes under my eyes. I've got quite a lot of make-up really! Baby Doll mascara, green eye-liner and Light Beige lipstick, Atkinson cleansing milk, Lipsil, Rimmel Hide & Heal, and Miner's Honey Baby 3 - though the only thing I really use is the lipstick. Fiddled with my hair and I've now decided I'm going to have it like Francoise Hardy with a parting down the left and my fringe swept across behind my ear. It's so nice being able to change your hair. I was getting bored of a centre parting. Went down to the boat - first time this year. Listened to Radio One on the way down, it was Keith Skues. The music he played was inexcusable, but he, if it's possible, was worse. It's incredible to think that the government have the nerve to put on programmes like that. Now that Caroline has gone it is literally impossible to listen to good music anymore. When we got to the Marina, Rosko came on, at last - God what a difference. He didn't play any good records either, but at least they weren't of the Tremeloes kind. Went along to the Stores - no Moustachy to cheer it up a bit. It poured after lunch so about four we decided to go home. On the way we overtook a silver E-typish car with two long-haired chaps who waved to Chump and me! We kept looking out for them thinking they'd catch up but they never came. Pa went so fast we left them right behind, jolly annoying. Watched a super programme by Robert Morley called 'Was Your Schoolmaster Really Necessary?' He hates them! I don't blame him. He had a foul public school education which was based on conforming to everything. Exams and all the other silly things about education should in principle be abolished; they prove nothing to the teachers and they encourage competition between the children. There was one fabulous school he want to, a primary one in London, very progressive, with a headmaster who said what matters is that the children enjoy school and that the masters must above all be humane. The teachers were so kind, interested and encouraging. He said having exams "is like having a running race where one child has no legs": it proves nothing you didn't already know. Spent all morning reading the Observer Supplement. There's an article on the new transplant, the first one in Britain. Mr Batchelor is mentioned several times as he did the matching of the tissues. Then Chump and me went through the play twice. If I put my shoulders right back and pull my tummy in, Mrs Webb's walk comes more easily. I spent ages in the bathroom making up my eyes after Ma and Pa had gone to bed. I splashed on huge messy lashes in black and green all around my eyes - fabulous effect. You could make a name for yourself as a model if you started wearing eyes like that!